It is recommended that you first consult fact sheet C1 "General principles and methods of education and awareness as to hygiene and health issues". 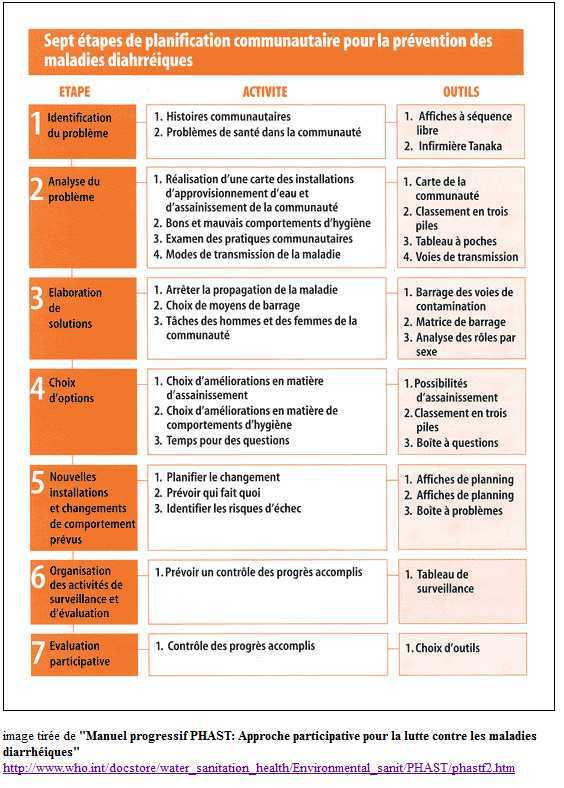 The PHAST method (Participatory Hygiene and Sanitation Transformation) is one of the main methods for which the main principles have been covered in fact sheet C1. The Purpose of these methods is to associate and to involve the populations in the search for satisfactory and sustainable solutions in terms of hygiene and health. PHAST is particularly intended for fighting diarrheal diseases. 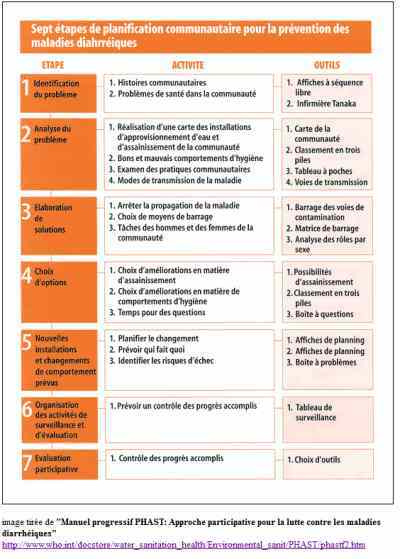 The PHAST method was originally designed by UNDP and WHO in 92, using the "SARAR" facilitation method (cf. appendix) and "prowess" then tested and improved in the field in Zimbabwe, Botswana, Uganda and Kenya, in coordination with the national governments, NGOs, UNICEF and bilateral funding providers. 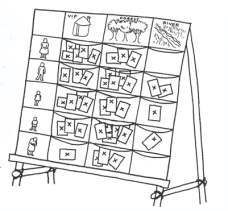 This method is intended to assist underprivileged populations of the same village or section of town but can also be used by more specific groups such as marginalised populations and in particular women, who are often excluded from the decision-making process. It is therefore necessary to spark interest, educate and give responsibility to the populations concerned with the stakes regarding healthy and sustainable management of health and hygiene issues pertaining to water or sanitation. Firstly, all of the populations who do not have satisfactory access to water and sanitation, without however excluding all of those that already do. 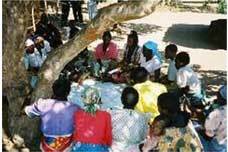 At the outset, programmes such as PHAST were created to assist community groups (rural villages, small towns, etc. ), as it is easier to involve a limited number of people and the members of the same group or community. However, awareness and education campaigns can also be set up on larger scales, such as is the case with the State of Mali for example. In order to be effective, the duration of the period of awareness must be at least one year, even if the use properly speaking of the methods can last for much less time. People must therefore be trained who will continue to make their fellow citizens aware once the methods have been completed. It is important to ensure the involvement of the marginalised and economically underprivileged population and women in particular, who are often excluded from the decision-making process. The other population with priority is of course that of schoolchildren for whom it is necessary to devote at least four sessions a year. An attempt must be made with the approval of the teachers to include sanitary educational booklets in the programme which will give rise to questions that are suited to the level of the students. Two points are fundamental in allowing for successful projects. On the one hand, the behaviour of the leaders who, while being present, place the community at the centre of the action and discussions (the leader is an enlightened facilitator). On the other hand, the elaboration of tool kits that take the cultural characteristics of the communities into account and which are updated by the leaders. - Wide view of the realities of each person rather than just averages based on statistics. - Large variety of tools making it possible to adapt to each situation. - Clarification of the roles, responsibilities and objectives over time. - Appropriation of the dynamics by the beneficiaries. - Once the decision have been taken by the community, some may become sources of income (pay toilets, access to running water for a fee, employment for maintenance agents, etc.) as such giving the members of the community the financial possibility to cover the water and sanitation facilities. - Requires good knowledge of the context, stakeholders, power dynamics and of the stakes of the interests. - Risk of seeing some parties monopolise the process in order to serve their own interests. - Can reinforce or instigate conflicts within a community. - Risk of excluding certain groups. - Requires a lot of time from the participants. Costs can vary greatly but a general amount can be retained of €1 for two inhabitants. This cost can become more affordable if grants are obtained or if revenue can be drawn from the measures set up. Be sure when developing budgets to take the rate of inflation into account, which can be very high in certain developing countries. - A survey on the existing situation : sanitary, technical, economic (then require participation in line with the means) and political (know the forces present at the local level, especially at the town hall). - A survey on the knowledge of the population, on its level of education. - An ethnosociological survey on the practices, habits and behaviours of the population. Success stories must be shown ! Influential people must be invited to discover the places where the projects carried out have often resulted in improving the living conditions more easily. 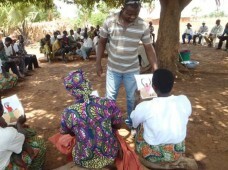 In each village, three volunteers from the local water committee were retained to run the unfolding of the method in 5 phases, with each giving rise to 3 or 4 practical, interactive and highly participative activities thanks to a set of tools adapted to each phase (2 to 4 tools for each phase) : creation of a map of the water supply facilities, drawings, tables of community practices, question boxes, etc. This method, from which the PHAST method comes, includes five principles. - Self-confidence : in order to identify and solves one’s own problems. - Associated forces : act in groups in order to be stronger and learn to work together. - Ingenuity : each person is a potential resource in searching for solutions to problems. - Planning the action : things can change only if suitable actions are planned and undertaken. - Responsibility : the decisions have to be assumed by the group. 1. Train the trainers in the SARAR method. 2. The trainers train the leaders in charge of using the SARAR tools for training and leading populations. 3. 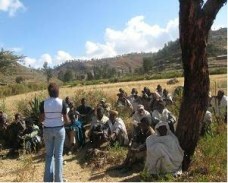 Train village inhabitants that are able to use the SARAR tools and acquire objectives of the project. 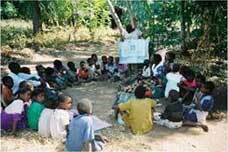 Their training allows the community to continue endogenous development. - WHO-UNDP : Document "The ’PHAST’ initiative" - Participatory Hygiene and Sanitation Transformation - A new method of working with the communities." Available on request at the African Pole of Secours Catholique, 106 rue du Bac 75007 Paris.